The Golden Retriever is very noble, self-confident, sensitive, intelligent, and adaptable. They are one of the world's most popular pets and make great companions. Golden Retrievers are sturdy, strong, and kind, known for their adeptness at hunting and their strength of character. Golden Retrievers bark infrequently, but do bark when startled, making them poor guard dogs. The Golden Retriever is very noble, self-confident, sensitive, intelligent, and adaptable. They are one of the world's most popular pets and make great companions. Golden Retrievers are sturdy, strong, and kind, known for their adeptness at hunting and their strength of character. Golden Retrievers bark infrequently, but do bark when startled, making them poor guard dogs. 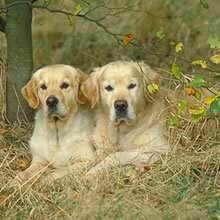 Golden Retrievers easily get along well with their friends and companions, but can be belligerent with unknown visitors. They get along especially well with children, with whom they are gentle and patient. They are also friendly with other dogs and other household pets. The Golden Retriever is very devoted to family, and eager to please. The Golden Retriever is simply loving and loveable! You can find Golden Retriever puppies priced from $200 USD to $7000 USD with one of our credible breeders. Browse through our breeder's listings and find your perfect puppy at the perfect price. Golden Retriever Puppies for Sale - Shipped Worldwide! Finding the right Golden Retriever puppy can be dog gone hard work. PuppyFind® provides a convenient and efficient means of selecting and purchasing the perfect Golden Retriever puppy (or Golden Retriever puppies) from the comfort of your home, 24 hours a day, 7 days a week. Take advantage of our PuppySearch or leisurely browse our directory of hundreds of dog breeds, Golden Retriever dog breeders, Golden Retriever dogs for adoption, and Golden Retriever puppy for sale listings with photos and detailed descriptions. Some Golden Retriever puppies for sale may be shipped Worldwide and include crate and veterinarian checkup. Many Golden Retriever dog breeders with puppies for sale also offer a health guarantee. With thousands of Golden Retriever puppies for sale and hundreds of Golden Retriever dog breeders, you're sure to find the perfect Golden Retriever puppy.